Ubuntu Global Bug Jam Success! Wow, what an incredible Ubuntu Global Bug Jam we had this weekend! Thanks to everyone who got involved. Safe to say, we not only beat the number of bugs touched last year, but we smashed it! Amazing! Its events like this that really help us spread the Ubuntu Ethos. Thanks to everyone who got involved and helped make Ubuntu that bit better this weekend! “After introductions were out of the way, it was bug squashing time. This is where the community feeling started to sink in for me. In one corner of the room, we had one person teaching another person how to program in C. In another corner, we had people working on a new logo for the ubuntu-chicago Launchpad page. And all over the place, we had people triaging and fixing bugs. Whenever somebody had a question, there was usually someone in the room who had the answer. However, even with all of the knowledgeable people that were present at the event, a question regarding 5-a-day came up that nobody knew the answer to. As I was preparing to ask the question on IRC, Richard Johnson pulled out his cell phone and first called Daniel Holbach, who was sleeping, and then called Jorge Castro who was able to answer the question. All over the internet, people refer to the Ubuntu Community. This bug jam really made it clear to me that we are not just a community, we are a giant family. Not only do we work together to make Ubuntu a great opperating system, but we also care and look out for each other”. Ubuntu-ie mightn’t have squashed too many bugs, but we got together and learnt a lot about bug triaging, as most of us were new to working on bugs. We’re already looking into organizing next bug jam soon. Overall, it was a great day for our LoCo! While the pictures of geeks with laptops are nice what I am really interested in is. Where do I find, when relevant, a list of bugs handled. Including a list of bugs filed upstream with patches or a list of upstream check-ins to reflect this work affecting the FLOSS world? If that eee didn’t subsequently fall to the ground, I no longer trust the laws of physics. There is something insanely cool about so many randomly distributed people coming together for the International Ubuntu Conspiracy. WOW ! this is really neat I didn’t realize there were two such events so close to me. Probably because I dont use Ubuntu. The community end of Ubuntu really does push the limits when coming to events like this. Excellent work all ! Chicago had a bunch of first timers, and when I say first timers, out of the 30 or so in rotation, Nathan, Jim, and I were probably the only ones who had spent any time triaging and fixing bugs in the past. So Nathan, Jim, and I, spent time fixing bugs while the rest of the group got into the swing of things by triaging. Before you knew it, some of the new people went from triaging right into fixing bugs. Pretty cool! Our location was awesome. The company was Centro and they let us use their space like it was our own office. We are probably going to start doing this more often, as everyone who showed up had a blast and stated they wanted to do it more. We shall see what the future holds. 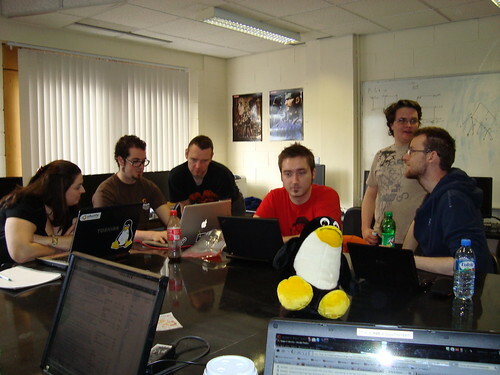 Feel free to link to by blog talking about the Ubuntu-UK Birmingham bugjam.